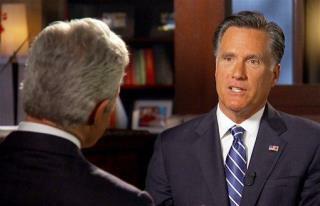 Taxes were in the spotlight during Romney's interview, as he defended his own 14.1% tax rate, Politico reports. It's the "right way to encourage economic growth—to get people to invest, to start businesses, to put people to work," he said. Romney also discussed health care, pointing out that an uninsured heart attack victim isn't left to "sit in their apartment and die." Instead, there's the ER: "We pick them up in an ambulance, and take them to the hospital, and give them care. And different states have different ways of providing for that care." Interesting, notes the Huffington Post, because Romney said the opposite on Morning Joe in 2010: "Look, it doesn't make a lot of sense for us to have millions of people who have no health insurance and yet who can go to the emergency room and get entirely free care for which they have no responsibility." Obama was similarly on the defensive, notes the Los Angeles Times, as he responded to Romney's suggestion he's been weak on defense. If the former governor "is suggesting that we should start another war, he should say so," Obama said. The president acknowledged the frustrations of his job, Politico adds. His "biggest disappointment": not changing "the tone in Washington." "I’m the first one to confess that the spirit that I brought to Washington, where we weren’t constantly in a political slugfest but were focused more on problem-solving ... I haven’t fully accomplished that," he said. The fact still remains that during Vietnam, the mormon church was handing out "religious deferrments" like lolly pops. After "supporting our troops" in Vietnam, Romney was afraid he would be drafted if he was in the US. So daddy sent him to France to avoid the draft. None of the Romney family has served. Why? Because they are above all that. He's lucky he didn't talk to my veterans group, he would be walking funny for a week. Where are Romney's tax returns?